The Beta Flex Shield can be maneuvered into any position to maximize the technicians' protection from splashes. Each shield is made of clear, scratch resistant, Lexan® barrier, which is 3/8" thick acrylic. It attaches to two 18" flexible support tube(s) The 4" x 4" base of each flexible tube maybe mounted to lab bench, wall or shelf with screws or double-sided tape. 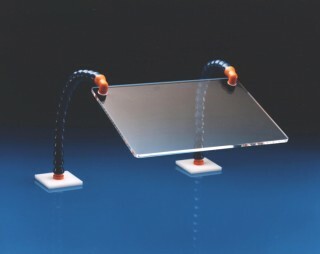 Additional mounting accessories include C-Clamp, Magnet or large laminated base.